I installed Ubuntu on my laptop and something happened and my Windows 7 bootloader is missing. I can boot only Ubuntu. 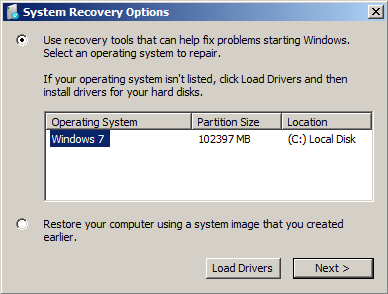 So, I tried to do something like suggested here How to restore Windows 7 loader or here, but when I see system recovery option there is no Windows 7 option. It will hopefully detect the Windows 7 installation and add its option to the grub boot menu. This tutorial shows how to repair your Windows bootloader (MBR) from Ubuntu dual boot or Ubuntu live DVD/USB. This can be useful if you don't have a Windows DVD on hand. Boot into your Ubuntu operating system. When you're in Ubuntu, open the terminal and follow the below steps. Now run these commands to install syslinux, which is a suite of lightweight IBM PC MBR bootloaders for starting up computers with the Linux kernel. You can use this utility to boot to your windows. SuperGrub2 lets you boot to any present OS regardless of MBR or Boot menu. You can also use Rescatux from the same people to reinstall your windows boot loader. Not the answer you're looking for? Browse other questions tagged boot windows bootloader or ask your own question. Accidentally deleted a partition, now I am finding just the grub rescue window. What should I do? How to restore Windows7 after restore ubuntu bootloader? Someone accessed my computer and somehow disabled the Ubuntu bootloader. How can I get it back?